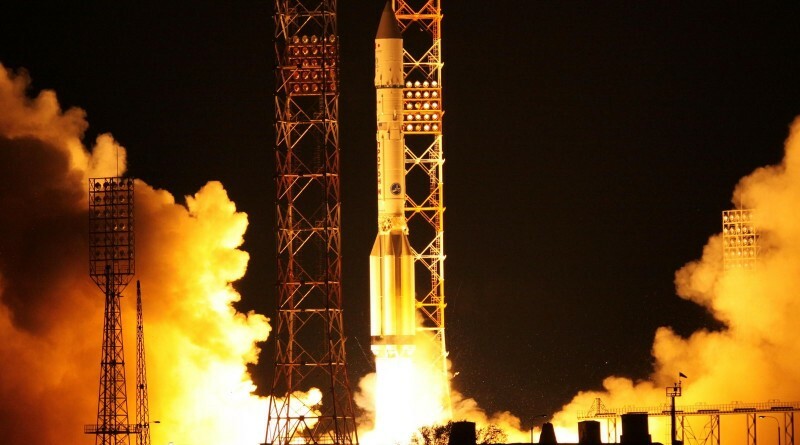 Russia’s Proton-M heavy-lift workhorse rocket lit up the night skies over the Baikonur Cosmodrome on Friday, blasting off from Site 200/39 at 20:40 UTC to deliver the Turksat-4B communications satellite to orbit. The flight to Geostationary Transfer Orbit took nine hours and 13 minutes and involved five burns of the Briz-M upper stage needed to methodically raise the craft’s orbit. 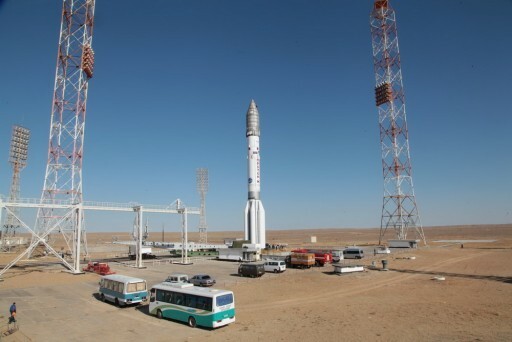 Jumping off its launch pad under the loud thunder of its six main engines, Proton began racing to the north-east as part of a standard departure of the Baikonur Cosmodrome, en-route to Geostationary Transfer Orbit. The first stage fired for two minutes before handing off to the second sage and its four engines for a burn of three and a half minutes. Next up was Proton’s third stage that had been the cause of two launch failures in the last 17 months, but performed flawlessly on Friday, successfully concluding Proton’s mission nine minutes and 42 seconds into the flight when the Briz-M was sent on its way, now in control of the flight. Briz-M was first tasked with a burn of four and a half minutes to lift the stack into a Low Earth Parking Orbit for the first coast phase. 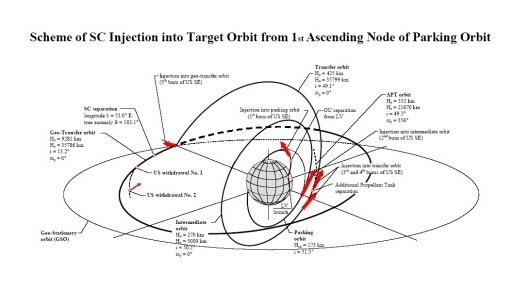 Sticking to a well-established mission profile, Briz-M needed two orbits and three burns to raise the apogee of the orbit to Geostationary Altitude followed by a long climb to said apogee where the fifth burn took place to adjust the inclination of the orbit and bring up the perigee. Spacecraft separation occurred at 5:53 UTC on Saturday, after a nominal flight – according to navigation data collected by Briz-M itself. Turksat 4B is the second of two satellites ordered by Türksat AS from Japanese satellite manufacturer Mitsubishi Electric under a contract of $571 million. Together with Turksat 4A, the satellite will deliver a variety of communications services to Europe, Asia and Africa with special focus on the Turkish territory. 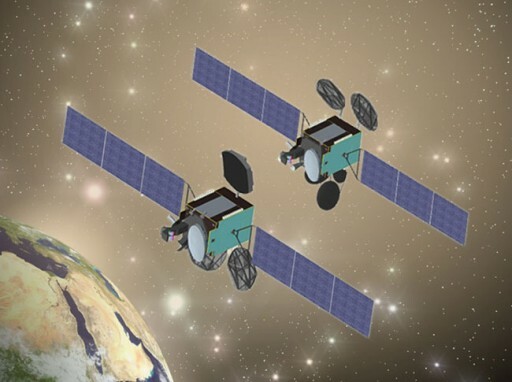 The 4B satellite will be mainly used in Fixed Satellite Communication services via Ku- and C-Band and broadband connectivity and data services in Ka-Band. It is equipped with 43 transponders to deliver 15 years of service from an orbital position of 50 degrees east in Geostationary Orbit. Countdown operations for Proton’s overnight mission were started on Friday, 11.5 hours ahead of the planned T-0 when the Briz-M upper stage was activated for its final set of testing activities, reconfigurations and the loading of flight software containing all instructions for the multi-hour mission. 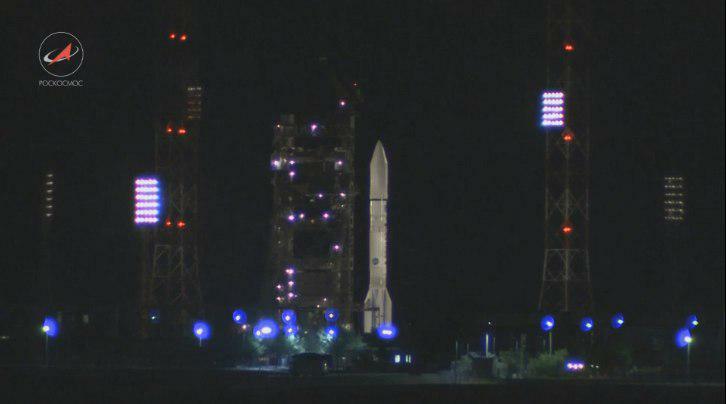 Engineers spent the first hours of the count closing out the Proton-M rocket and preparing for propellant loading. Meanwhile, the satellite was undergoing final health checks and battery charging for its flight into orbit. The Russian State Commission provided the green light for propellant loading seven and a half hours prior to launch after a final in-depth review of launch vehicle testing performed over the last three days and the status of countdown operations. Proton-M was activated six hours prior to liftoff for a thorough set of checks of its Guidance System, the Spacecraft Abort Unit, Propulsion Systems and communications systems. 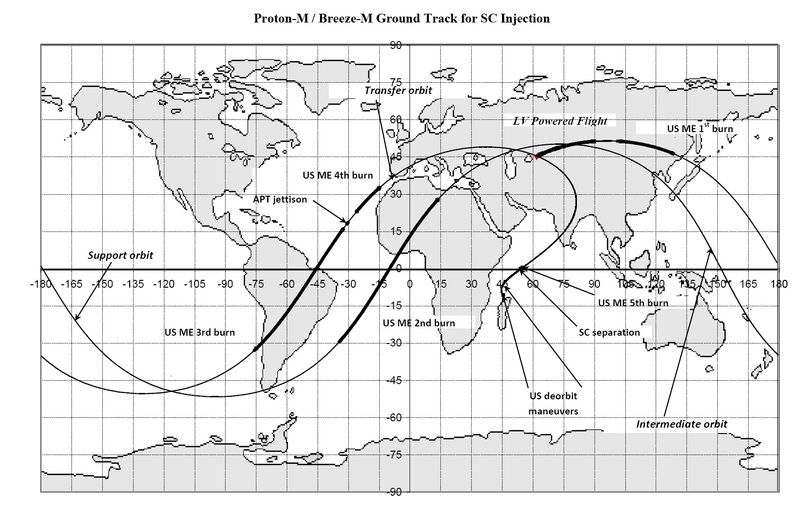 The three-hour propellant loading sequence commenced inside six hours and saw the three stages of Proton being loaded with 622,075 Kilograms of toxic Unsymmetrical Dimethylhydrazine and Nitrogen Tetroxide. With Proton fully fueled for flight, the launch pad was re-opened to all personnel for the final hands-on tasks to be completed on the vehicle and pad such as removing tanking equipment and buttoning up the launch vehicle and service structure. 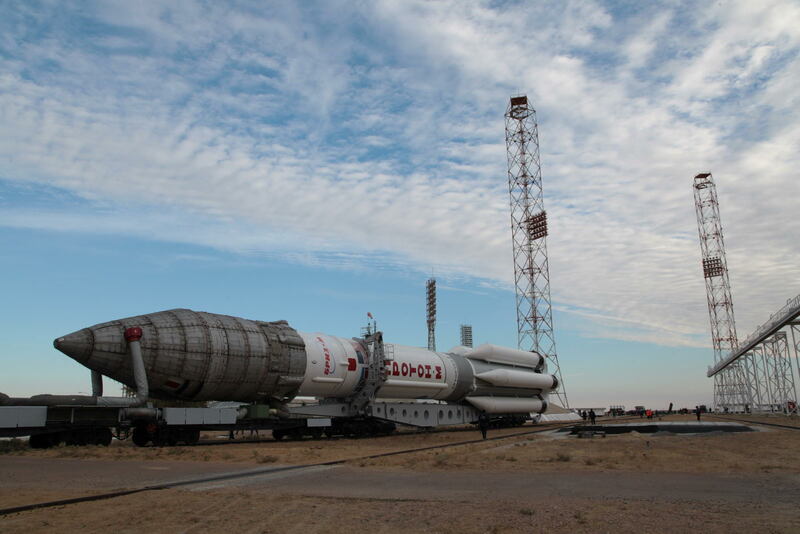 The large Service Structure began its retraction from the 58-meter tall rocket around one hour ahead of liftoff to be moved to a safe distance to the vehicle. Proton’s Master Countdown Sequencer was activated at T-45 minutes and various clocks on the ground, the launcher, upper stage and satellite were synchronized. 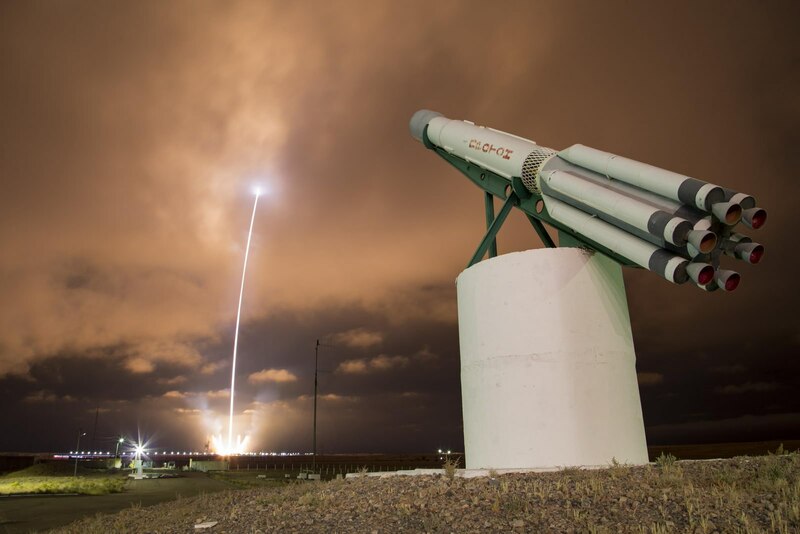 The Launch Abort System and the Spacecraft Abort Unit were configured for launch and Turksat-4B headed into its final preparatory steps inside T-30 minutes – being switched to battery power and enabling its launch sequence. A final GO from all support stations was provided at T-10 minutes, confirming that the launch pad was clear, the range was GO and all systems on the vehicle were ready to support the flight. The Automated Countdown Sequence began at T-5 minutes to put the launch vehicle through the last steps needed to transition it to its autonomous liftoff configuration. Briz-M made its switch to battery power, the three stages of the Proton began pressurizing for flight and the Proton also made its transition to internal power. At T-1:53, the launch vehicle’s own onboard sequencer assumed control of the countdown leading to a final automated health check at T-3.1 seconds that had to be successful for the ignition sequence to be triggered. 2.5 seconds prior to liftoff, the six RD-275M engines were commanded to ignite and came to life, soaring up to a preliminary thrust stage before ramping up to a collective liftoff thrust of 1,014 metric-ton-force. Not using a hold-down system, Proton began rising when its thrust exceeded its weight, pulling the main umbilical at the base of the rocket upward until separating and issuing the Contact Liftoff Command. 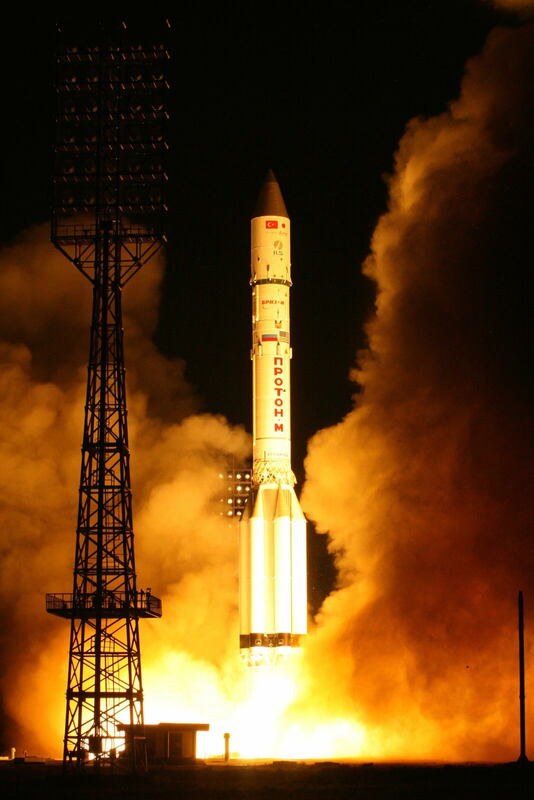 Liftoff occurred at the planned time of 20:40:11 UTC as Proton began its short vertical climb, burning 3,500 Kilograms of propellant each second of the flight. 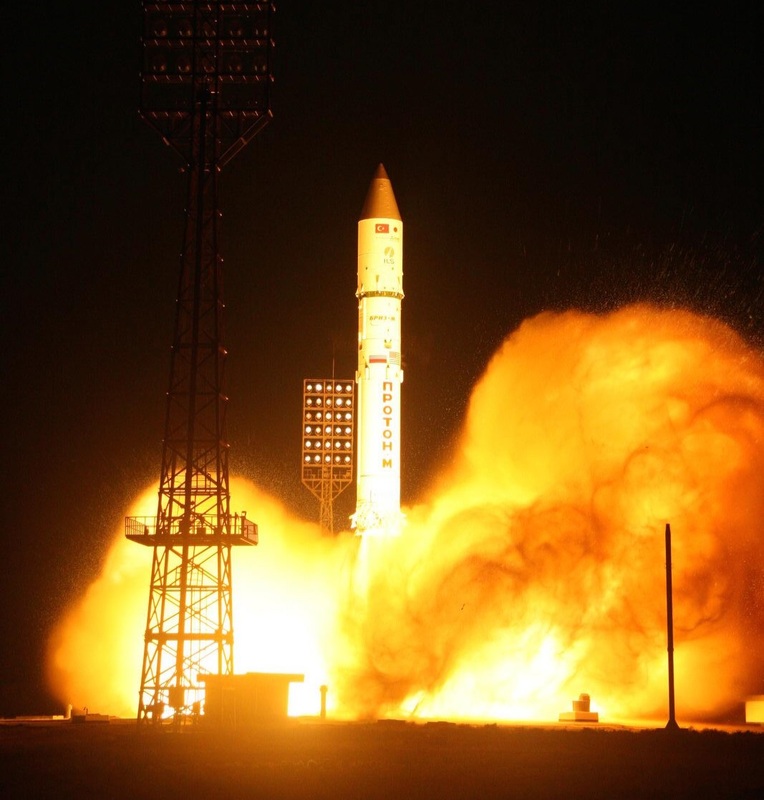 Blazing into a light fog over the pre-winter Cosmodrome, Proton initiated its Pitch and Roll Programs that aligned the vehicle with the standard 61.3-degree launch azimuth – the normal departure path to the north-east towards the Russian border. 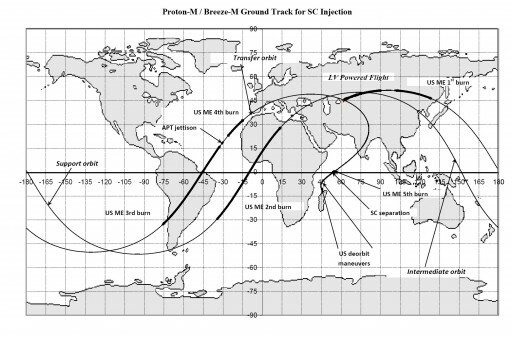 Proton broke the sound barrier and encountered Maximum Dynamic Pressure one minute into the flight, beginning to race downrange and vanishing into the low clouds with no chance to visually track the progress of the vehicle from Baikonur. Real-time calls from the launch bunker indicated good structural parameters, nominal stabilization stable engine pressures and a nominal trajectory. 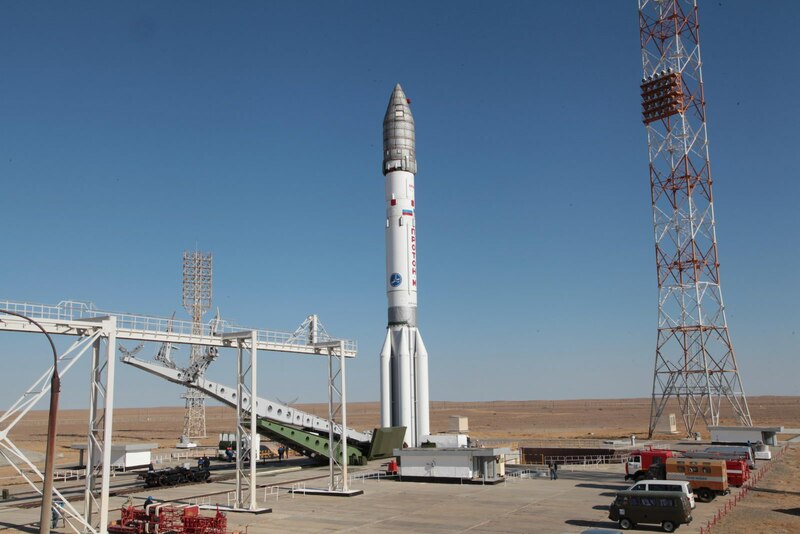 Proton’s first stage measures 21.2 meters in length and 7.4 meters in diameter featuring outboard fuel tanks that give the stage its characteristic appearance. The six RD-275M engines, each delivering 1,833kN of vacuum thrust, burned though 419 metric tons of propellants in less than two minutes. Separation of the first stage was accomplished at T+1 minute, 59 seconds in hot-staging mode, that is shutting down the first stage followed by sending the ignition commands to the four second stage engines and then firing the separation pyros to allow exhaust from the engines to push the stages apart. Clean staging was confirmed by the launch team and all four engines of the second stage started as planned, generating 244,600 Kilogram-force of thrust to continue powered ascent. Proton’s second stage is 14.5 meters in length and 4 meters in diameter with a 176,800-Kilogram propellant load. It is powered by three RD-0210 engines and one RD-0211 which includes heat exchangers generating high-pressure gas to keep the tanks at flight pressure. 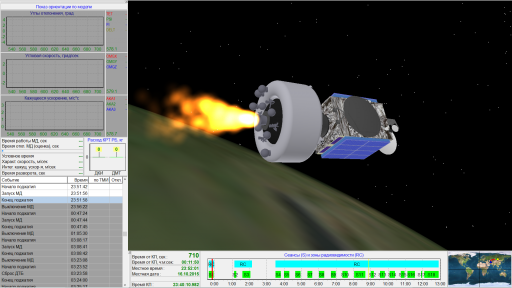 The second stage fired for three minutes and 28 seconds showing a rock-solid performance as confirmed by telemetry analyzed in real time and tracking of Proton’s ascent path. Staging between the second and third stage also used a hot-staging sequence that began at T+5 minutes and 24 seconds when the four-chamber RD-0214 vernier engine of the third stage was ignited. Second stage cutoff and the initiation of separation pyros occurred three seconds later, allowing the third stage to pull away powered by its 3,200kgf vernier to generate a separation distance before firing its large RD-0213 main engine. Ignition of the RD-0213 was confirmed just after passing T+5:30, soaring up to a thrust of 59,450kgf for a burn of four minutes to finish Proton’s mission. 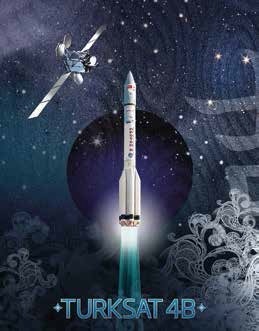 Loaded with 46,660 Kilograms of propellants, Proton’s third stage is 4.14m in diameter and 6.5 meters in length. Five minutes and 47 seconds into the flight – when Proton was close to 140 Kilometers in altitude – the two halves of the protective payload fairing split open and separated as the vehicle had left the dense atmosphere and Turksat 4B was no longer in danger of being harmed by aerodynamic forces. Now in operation, the third stage of the Proton was the biggest concern over the past two years, responsible for two failed missions in 2014/15. Improvements were made to the materials and manufacturing techniques of the RD-0214 main engine to make it more tolerant to border-line environments that can occur on some flights. No problems were noted in Friday’s mission and the launch bunker continued to report good performance of all systems as Proton approached the end of its part of this mission. Shutdown of the third stage main engine came nine minutes and 31 seconds into the flight while the vernier fired for another ten seconds to optimize the insertion accuracy into the expected sub-orbital trajectory. The Briz-M upper stage was separated nine minutes and 42 seconds after liftoff, marking Proton’s next success – hoping to roll into a positive streak of successful flights to catch up with a busy manifest and send a message to potential commercial customers for future launches. After separation from the third stage, Briz-M used its attitude control thrusters to stabilize in the proper orientation for its first main engine burn that was to come after a 124-second coast phase inserted to allow Briz-M to fly uphill so that the burn could place the stack in a circular parking orbit. Ten seconds prior to main engine start, Briz-M ignited its settling thrusters to create safe conditions for ignition through the small acceleration imparted by the thrusters that generates a two-phase system in the propellant tanks, ensuring the main engine only receives liquid propellants. Main engine ignition occurred 11 minutes and 46 seconds after liftoff as Briz-M assumed control of the mission, first tasked with lifting the satellite to a Low Earth Parking Orbit. The burn was 4 minutes and 26 seconds in duration (planned), shortened by 2 seconds as Briz-M dynamically adjusted for insertion errors by the Proton, flying out a slight overperformance of the launcher. The mission aimed for a circular parking orbit at 180 Kilometers, inclined 51.5 degrees and achieved this orbit with only a minor deviation. Starting out in this Parking Orbit, Briz-M was planned to stick to the standard flight path, making four additional burns in a methodical sequence to reach a Geostationary Transfer Orbit with increased perigee to allow the spacecraft to save propellants when climbing into its slot in Geostationary Orbit. 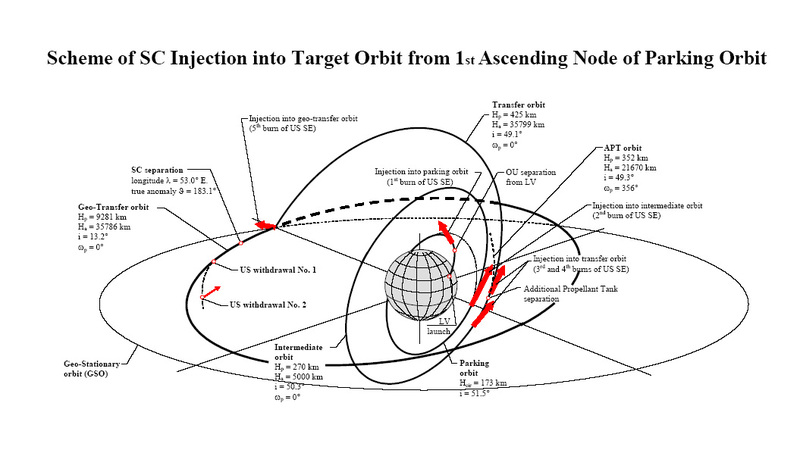 The first three burns were used to raise the apogee of the orbit to Geostationary Altitude, performed on two consecutive perigee passes, and the final burn for a significant reduction in inclination and increase in perigee altitude. Briz-M weighs 22,170 Kilograms and its 4.1 meters in diameter and 2.6 meters tall sporting a single main engine, four propellant settling thrusters and a series of attitude control jets. The S5.98 main engine delivers 1,940 Kilogram-force of thrust and can perform multiple burns, allowing Briz-M to access a variety of orbits. 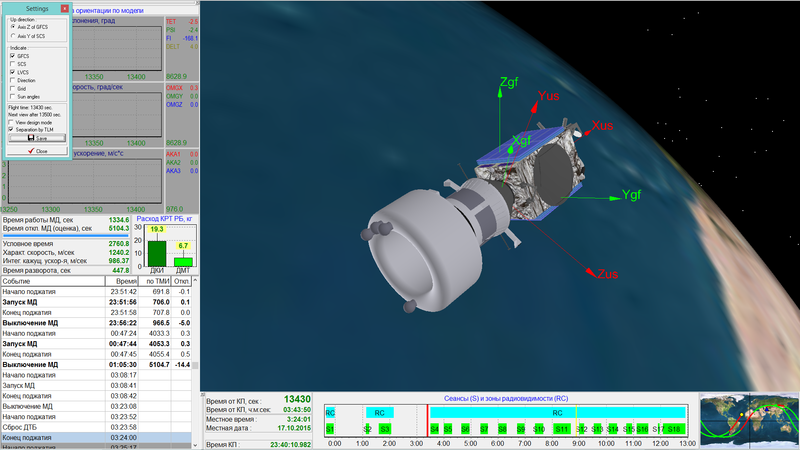 After arriving in orbit, Briz-M entered a 52-minute coast phase to set up the proper position for the second burn in an overall mission design that aimed to place the apogee position above the equator. Therefore, the second burn was set up to center the ascending node of the orbit. Ignition of the S5.98 engine took place at T+1:07:33 when the stack will be over the Atlantic Ocean. The 17-minute and 32-second burn occurred as the stack passes over Africa, ending before the craft heads over the Mediterranean. The second burn aimed for a 270 by 5,007-Kilometer orbit at an inclination of 50.3° and, according to Khrunichev reached exactly this orbit with only a few meters of deviation. Due to the relatively low performance of the Briz-M engine, orbital mechanics do not allow an economical raising of the apogee in a single pass given the long burn duration that would be necessary. Therefore, Briz-M had to perform two apogee-raising maneuvers, separated by a coast of nearly an entire orbit. The third burn started three hours and 28.5 minutes into the flight and lasted 14 minutes and 21 seconds followed by the separation of the Auxiliary Propellant Tank at T+3:43:41 which used the settling thrusters of Briz-M to open a gap between the stage and the spent tank. The APT carried 14,600kg of propellants and separated once empty to eliminate dead weight and thus optimize the performance for the upcoming burns. The fourth burn commenced 82 seconds after APT jettison to finish apogee-raising, targeting an orbit of 425 by 35,799 Kilometers inclined 49.1 degrees. It was 3 minutes and 6 seconds in duration, shortened by three seconds. The 3rd/4th burn pair occurred on a pass from the Pacific Ocean, over South America and the Atlantic with shutdown just west of the north-African coast line. Next, Briz-M settled in for its longest coast phase of just over five hours to be able to climb all the way up to apogee. S5.98 ignited again at T+8 hours 51 minutes and 40 seconds on a burn of 8 minutes and 59 seconds – firing out of plane to reduce the orbital inclination while also raising the perigee of the orbit, cutting the amount of fuel needed by the satellite when making its transfer to Geostationary Orbit. 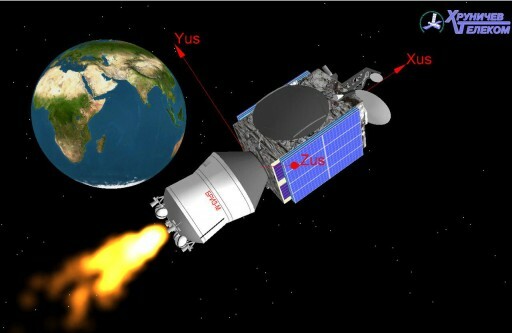 Turksat-4B aimed for an orbit of 9,281 by 35,786 Kilometers at an inclination of 13.2 degrees. Separation of the satellite was confirmed nine hours and 13 minutes after liftoff, at 5:52:51 UTC on Saturday. After separation, the satellite was to establish attitude control and communications with the ground for its initial set of operations including a series of apogee maneuvers occurring in the coming days as well as the deployment of the solar arrays and communication antennas. Briz-M is tasked with two disposal burns, the first a 12-second maneuver at T+11:16:40 and the second a 100-second burn at T+12:28:20 – lowering the apogee and perigee of the orbit to move it out of the way. Friday’s launch marked the 408th Proton-M flight since its inauguration in 1965, it was the sixth in 2015.